Newbury Park, Calif., Jan. 18, 2019 - Platinum Tools® (www.platinumtools.com), the leader in solutions for the preparation, installation, hand termination and testing of wire and cable, is proud to announce it will feature numerous new products during the 2019 BICSI Winter Conference & Expo, held in Orlando, Fla. at the Gaylord Palms Resort & Convention Center from Jan. 20-24, booth #100. 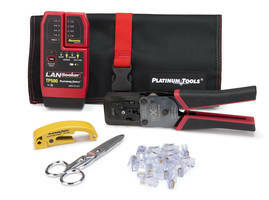 Among the new and now shipping products that Platinum Tools will showcase are the Waterproof RJ45 Coupler System (p/ns 740C & 741C), EXO Termination Kits, Shielded and Unshielded Unloaded Patch Panels, RJ45 Cat6A/7 Connectors 28-26 AWG, and the EZ-12/11 Die for EXO Crimp Frame. In addition, Platinum Tools will also give away their 8-in-1 Ratcheted Stubby Screwdrivers (while supplies last) during the show. Platinum Tools’ 8-in-1 Ratcheted Stubby Screwdriver is the perfect tool for those cramped spaces, featuring a 6-piece bit storage unit conveniently built directly into the handle. Simply unscrew the top cap and swap bits out as needed. It also features a full ratcheting mechanism and a non-slip rubberized grip for quick tightening and loosening of screws with minimal effort. Platinum Tools’ Waterproof RJ45 Coupler System is rated to IP67 standards in order to meet those harsh environmental conditions commonly found in outdoor and indoor installs, such as wireless towers, security systems, outdoor entertainment venues, industrial manufacturing, LED lighting, emergency communications, marinas, and more. Including the EXO Crimp Frame® with the EXO-EX and the EZ-RJ45® interchangeable dies, the EXO Termination Kits supply everything needed to terminate Cat5e, Cat6, and Cat6A cables. Using the original EZ-RJ45 Cat5e and ezEX-RJ45®, ezEX®44, and ezEX®48 connectors give installers the fastest solution for terminating Ethernet cabling. The shielded and unshielded Unloaded Patch Panels make it easy to mix and match keystones, replace a damaged port, and add new runs. They also make category upgrades easy, maximize limited rack space, and are perfect for residential or small office applications. Interchangeable and reversible when used with EXO Crimp Frame®, the red EZ-RJ12/11 Die is used to terminate EZ-RJ12/11 connectors. It includes a single cycle crimp and flush trim, and connectors lock into tool for correct positioning during crimp. This die can also crimp other standard “non-EZ” or pass through style connectors. The EZ-RJ12/11 Die now gives the EXO Crimping System ability to crimp telephone connectors, such as RJ12/11.